From the analyses presented in previous chapters, it is clear that the growing demands for natural resources in recent decades are putting pressures on the environment in increasingly complex and wide-ranging ways. Generally speaking, specific environmental issues, often with local effects, have in the past been dealt with through targeted policies and single-issue instruments, such as the approaches to waste disposal and species protection. Since the 1990s, however, the recognition of diffuse pressures from different sources has led to an increased focus on the integration of environmental concerns within sectoral policies, for example in transport or agricultural policies. Today’s main environmental challenges are systemic in character and cannot be tackled in isolation. The assessments of four environmental priority areas — climate change, nature and biodiversity, use of natural resources and waste, and environment and health — point to a series of direct and indirect links between environmental challenges. Climate change, for example, impacts all other environmental issues. Changes in temperature and precipitation patterns affect agricultural production as well as plant and animal distribution and phenology, and thus exert additional pressures on biodiversity (Chapter3). This may lead to species extinctions, particularly in arctic, alpine and coastal zones (Chapter2). 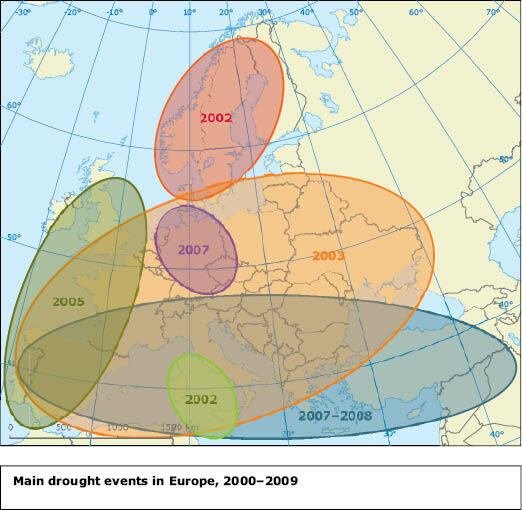 Similarly, changes in climatic conditions across Europe are projected to alter existing health risks by changing the occurrence of heat waves, cold spells and vector-borne diseases (Chapters 2 and 5). Nature and biodiversity are the basis for virtually all ecosystem services, including food and fibre provisioning, nutrient circulation and climate regulation — forests, for example, provide carbon sinks that help absorb greenhouse gas emissions (Chapter3). Thus biodiversity loss and ecosystem degradation directly affect climate change and undermines the way we are able to use natural resources. In addition, loss of natural infrastructure has been shown to have various harmful effects on human health (Chapter5). The use of natural resources and the resulting pollution of air, water and soil put pressure on nature and biodiversity through, for example, eutrophication and acidification (Chapter3). Ultimately, the use of non-renewable natural resources, such as fossil fuels, is at the heart of the debate about climate change. In addition, waste management is a key sector with regard to greenhouse gas emissions (Chapter2). How we use natural resources and dispose of wastes also links directly to several health aspects and contributes to the environmental burden of disease (Chapter5). Ultimately, environmental pressures that result from, for example, climate change, biodiversity loss, or the use of natural resources, are linked with people’s well-being (Chapters 2 to 5). Access to clean water and air are paramount to our health, but is often undermined by pollution and waste that result from human activities (Chapters4 and 5). Climate change puts additional pressure on air and water quality (Chapter2), while biodiversity loss may undermine the ability of ecosystems to provide, for example, water purification and other health-related services (Chapter3). Many of the links described above and in the previous chapters are direct, i.e. changes in the state of one environmental issue can translate directly into pressures of another. In addition, a number of indirect links occur with changes in one environmental issue resulting in feedbacks on another and vice versa. Land use and land-cover changes exemplify such indirect links. They can be seen to be both a driver and an impact, not only of climate change, but also of biodiversity loss and the use of natural resources. Thus, any change in land use and land cover resulting, for example, from urbanisation or converting forests to agriculture, affects climate conditions by changing an area’s carbon balance, as well as biodiversity by altering ecosystems. Natural capital and ecosystem services embrace many components. Natural capital is the stock of natural resources from which goods can be extracted and the flows of ecosystem services maintained. The stocks and flows rely on ecosystem structures and functions such as landscapes, soil, and biodiversity. • renewable and non-exhaustable resources — wind, waves, etc. Natural capital provides several functions and services — it provides the sources of energy, food and materials; the sinks for wastes and pollution; the services of climate and water regulation, pollination; and the space for living and leisure. Using natural capital often involves trade-offs between these functions and services. For example, if it is too intensively used for emissions and waste it can lose its capacity to provide flows of goods and services: coastal waters that receive pollution and excess nutrients will not be able to support previous levels of fish stocks. Most of the changes in the state of the environment described here are ultimately driven by unsustainable consumption and production patterns. These have resulted in unprecedented levels of greenhouse gas emissions and the depletion of renewable environmental resources, such as clean water and fish stocks, as well as non-renewable ones, such as fossil fuels and raw materials. This depletion of natural capital eventually affects human health and well-being, closing another environmental feedback loop. The various links between environmental issues, coupled with global developments (Chapter7), also point towards the existence of environmental systemic risks — that is the potential loss or damage to an entire system, rather than a single element. This dimension of emerging systemic risks can become particularly apparent when looking at how we choose to use the natural capital embodied in land, soil, water and biodiversity resources, and how we manage some of the trade-offs that are implicit in the choices we make (Chapters1 and8). The way land is used is one of the principal drivers of environmental change. Its influence on landscapes is a major factor in the distribution and functioning of ecosystems, and thus in the delivery of ecosystem services. 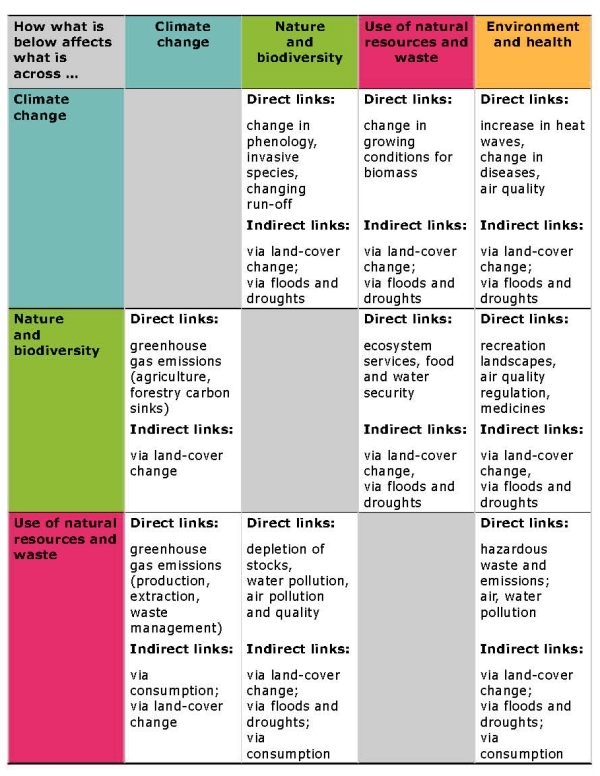 There are important links between land use and land cover and the priority environmental challenges analysed here. As already discussed in Chapter 3, our demands for food, forest products and renewable energy all compete for land as a resource. The landscape to a large extent reflects the choices that we make in this regard. 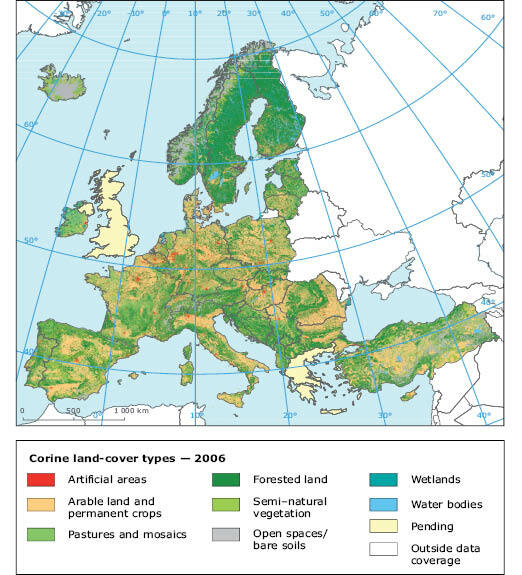 The latest Corine land-cover inventory for 2006 ( A ) shows a continued expansion of artificial surfaces, such as urban sprawl and infrastructure development, at the expense of agricultural land, grasslands and wetlands across Europe. The loss of wetlands has slowed down somewhat, but Europe had already lost more than half of its wetlands before 1990. Extensive agricultural land is being converted to more intensive agriculture and in parts into forests. Meeting our demands for land resources and ecosystem provisioning services is already a difficult ‘spatial puzzle’, but the real challenge lies in balancing them with the equally vital, yet less obvious, supporting, regulating and cultural services that ecosystems provide. Land-use changes in response to consumer demands and policy choices have implications, for example, for soil carbon storage and greenhouse gas emissions. They also affect biodiversity conservation and water management — including effects of droughts and floods as well as water quality. Note: Based on Corine land cover 2006; data coverage includes all 32 EEA member countries — with the exception of Greece and the United Kingdom — and 6 EEA cooperating countries. Source: EEA, ETC Land Use and Spatial Information. The case of bioenergy illustrates the issue of trade-offs. Modern approaches to gain energy from biomass, in particular linked to ambitious renewable energy policy targets, have gained significance over the past two decades and will continue to grow, driven mainly by energy security concerns and their greenhouse gas saving potential. Sugar cane and standard arable crops, such as maize or wheat, are currently the main inputs to biofuel production but the range of potential sources is wide including straw, energy grasses and willow plantations for cellulosic ethanol, wood waste and pellets for heat generation, and algae grown in tanks. Individual energy crops have very different environmental profiles( 1 ), while different bioenergy pathways — fuels, heating or electricity — show widely ranging efficiency ratios per volume of biomass used( 2 . Depending on the production pathway, the net benefits in terms of greenhouse emissions also vary greatly ( 3 ) ( 4 ) ( 5 ). Carbon emissions from the conversion of forests o r grasslands to energy crops, or due to the replacement of food production areas, can lead to higher greenhouse emissions than using fossil fuels (when considering a period of 50 years or longer) ( 6 ) ( 7 ). Where energy crops replace more extensive farming systems, negative impacts on biodiversity and landscape amenity value can be expected. Furthermore, energy crops are a potential competitor for water resources in water-poor regions of the world ( 8 ). Various recent studies have looked at the potential environmental gains and losses from a holistic perspective and recommend a cautious approach to the future development of bioenergy production ( 9 ) ( 10 ). Soil underpins the delivery of a range of vital land-based ecosystem goods and services. This complex biogeochemical system is best known as a medium that supports agricultural production. However, soil also is a critical component of a diverse set of processes from water management, terrestrial carbon fluxes, land-based natural greenhouse gas production and adsorption to nutrient cycles. Thus, we and our economy depend on a multitude of soil functions. Soil erosion is the wearing away of the land surface by water and wind. The main causes of soil erosion are inappropriate land management practices, deforestation, overgrazing, forest fires and construction activities. Erosion rates are very sensitive to both climate and land use, as well as to detailed conservation practice at the field level. Given the very slow rate of soil formation, any soil loss of more than 1 tonne per hectare per year can be considered as irreversible over a time span of 50–100 years. Water erosion affects 115 million hectares (ha) of soil or 12% of Europe’s total land area, and wind erosion 42 million ha. The Mediterranean region is the most affected. Soil sealing occurs when agricultural or other rural land is built on and all soil functions are lost. On average, built-up areas take up around 4% of the total area of Member States, but not all of this is actually sealed. In the decade 1990–2000, the sealed area in the EU-15 increased by 6%, and the demand for new construction sites for urban sprawl and for transport infrastructures is continuing to rise. Salinisation of soils results from human interventions such as inappropriate irrigation practices, use of salt-rich irrigation water and/or poor drainage conditions. Elevated salt levels in soil limit its agro-ecological potential and represent a considerable ecological and socio-economic threat to sustainable development. Salinisation affects around 3.8 million ha in Europe. The most affected areas are Campania in Italy and the Ebro Valley in Spain, but areas in Greece, Portugal, France and Slovakia are also affected. Desertification means land degradation in arid, semi-arid and dry sub-humid areas resulting from various factors, including climatic variations and human activities. Droughts are also associated with or lead to an increased soil erosion risk. Desertification is a problem in parts of the Mediterranean and central and eastern Europe. Soil contamination is a wide-spread problem in Europe. The most frequent contaminants are heavy metals and mineral oil. The number of sites where potentially polluting activities have taken place now stands at approximately 3 million ( a ). Source: Based on SOER 2010 Thematic assessment — Soil. For example, soil resources play a major role as a terrestrial sink of carbon and can contribute to climate change mitigation and adaptation. However, around 45% of the mineral soils in Europe have low or very low organic matter content (0 to 2% organic carbon) and 45% have a medium content (2 to 6% organic carbon) and soil organic matter in Europe is currently diminishing. Several factors are responsible for the decline in soil organic matter and many of them relate to human activity. These factors include conversion of grassland, forests and natural vegetation to arable land; deep ploughing of arable soils; drainage, liming, nitrogen fertiliser use; tillage of peat soils; crop rotations with reduced proportion of grasses. Water is an ecological and economic resource, renewable but finite. It is vital to support healthy ecosystems (Chapter3), while access to clean water is essential for human health (Chapter5). Furthermore, water is a key natural resource linked with agricultural, forestry and industrial production, household consumption, and energy production (Chapter4). Environmental pressures on European water systems are closely related to land-use patterns and related human activities in the river basins. The main pressures are diffuse pollution, water abstraction, and hydro-morphological changes in connection with hydropower generation, drainage and canalisation. Soil issues highlighted in the previous section, notably erosion and loss of water retention capacity, are also relevant to how we manage water resources. 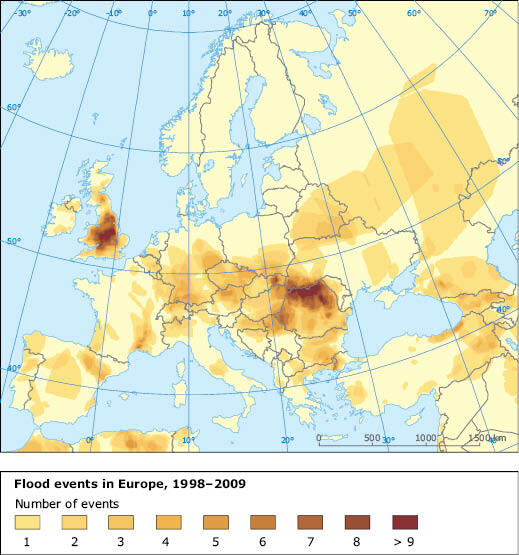 Large areas of Europe are affected by water scarcity and droughts, while other regions are increasingly exposed to serious floods. Over the past ten years, Europe has experienced more than 165 major floods, causing deaths, displacement of people and large economic losses. Future climate change is expected to make matters worse. The Water Framework Directive (WFD) ( 11 ) is the key policy approach aimed at tackling these challenges. It sets ecological limits to human water use and management. Furthermore, it obliges EUMember States and regional authorities to take coordinated measures regarding, for example, agriculture, energy, transport and housing, within the context of rural and urban spatial planning, while also taking biodiversity conservation concerns into account. As noted already (Chapters3 and 4), a first look at river basin management plans, shows that strong efforts are needed in the coming years to achieve good ecological status by 2015. For the WFD to be successful, integrated management of river basins is crucial, involving relevant stakeholders in identifying and implementing spatially-differentiated measures that often involve trade-offs between different interests. The management of flood risks, in particular the relocation of dykes and reestablishment of flood plains, requires integrated urban and land-use planning. Water makes vital contributions to economic activities including agriculture and energy production, and as a key transport route. As a connecting system it is also exposed to many different pressures and links the effects of some economic activities to others, for example agriculture via nutrient run-off to fishing. Climate affects both the supply and demand for energy and water, and energy conversion and water extraction processes have the potential to contribute to climate change. At the EU and national levels, there are different sectoral and environmental policies and measures that may conflict with water management and the objective of achieving a good ecological status of water bodies. Examples are policies for bioenergy crops and hydro-energy, the promotion of irrigated agriculture, the development of tourism, and expanding inland waterway transport. The Water Framework Directive provides options to develop integrated resource management at water basin level. This could help strike a balance between wider policy objectives — for examples related to energy and agricultural production, or reducing greenhouse gas emissions — as well as the benefits and impacts on the ecological status of water bodies, adjacent land ecosystems and wetlands. Furthermore, the water-energy link illustrates that coordinated water management in the context of energy generation is needed — to make use of hydropower, cooling, and bioenergy crops without impairing water ecosystems. The sustainability of energy use for desalination and wastewater treatment also needs to be evaluated. Common to most of the examples given so far is the fact that environmental problems in Europe cannot be studied or solved in isolation: European and global natural resource use are connected. The key question is to what extent Europeans will be able to rely on natural resources from outside Europe in the light of increasing worldwide demand. Europe’s consumption, however, already exceeds its own renewable natural resource production by approximately a factor of two ( 12 ). There is little doubt that increasing global food demand, the result of population increases and development, is likely to necessitate further land conversion and increased efficiency of food production( 13 ), at least at the global scale. Europe is an importer and exporter of agricultural products. The total volume and intensity of European agricultural production thus matters for the preservation of environmental resources and ecosystems in Europe and around the globe. Market pressures, technological development and policy interventions have resulted in a long-term tendency to concentrate agricultural production on the more fertile farmland areas in Europe, while marginal or remote farmland is being given up. The associated intensification leads to increased environmental pressure on water and soil resources in intensive farmland areas. In addition, abandonment of extensive farmland leads to a loss of biodiversity in the areas affected. Meanwhile, more natural vegetation cover can provide other ecosystem services — such as the carbon storage provided by forests. 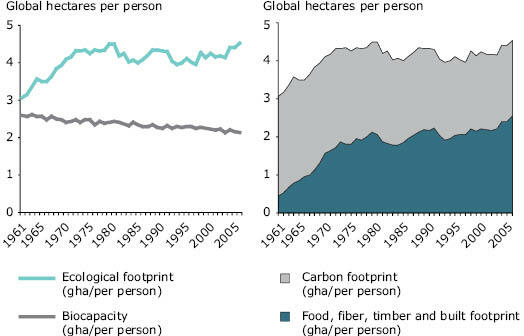 Note: The ecological footprint is a measure of the area needed to support a population’s lifestyle. This includes the consumption of food, fuel, wood, and fibres. Pollution, such as carbon dioxide emissions, is also counted as part of the footprint. Biocapacity measures how biologically productive land is. It is measured in ‘global hectares’: a hectare with the world average biocapacity. Biologically productive land includes cropland, pasture, forests and fisheries ( b ). Source: Global Footprint Network ( c ). Conversely — and in a global perspective — the conversion of forests and grasslands to agricultural land is one of the most important drivers for habitat loss and greenhouse gas emissions worldwide. There are clear links between the use of farmland in Europe and global agricultural trends, and both relate to environmental trends. Trade-offs associated with intensifying farming and environmental protection in Europe, and their implications for ecosystems around the world need further evaluation. An important consideration in this regard is the preservation of critical natural capital — such as fertile soils, adequate and clean water resources, and natural ecosystems that serve as carbon sinks, harbour genetic diversity and support food provisioning. All of this brings us back to the ‘spatial puzzle’: natural capital, including land, water, soil and biodiversity resources, provides a foundation for ecosystem services and other forms of capital that human society relies on (human, social, manufactured and financial capital). This dependency lifts the debate to yet another level of complexity: the need to balance different uses of natural resources within environmental limits becomes a truly systemic challenge. In order to maintain natural capital and ensure a sustainable flow of ecosystem services, further increases in the efficiency with which we use natural resources will be necessary — combined with changes in the underlying consumption and production patterns. Furthermore, integrated management approaches for natural capital need to take into account territorial concerns. In this context, spatial planning and landscape management can help balance the environmental impacts of economic activities, especially those related to transport, energy, agriculture and manufacturing, across communities, regions and countries. Dedicated management of natural capital and ecosystem services more than ever offers an integrating concept for dealing with a range of environmental priorities, and for linking to the many economic activities that bear upon them. Increasing resource efficiency and security, especially for energy, water, food, pharmaceuticals, key metals and materials, are essential elements in this regard (see Chapter 8). For references, please go to https://www.eea.europa.eu/soer/synthesis/synthesis/chapter6.xhtml or scan the QR code.